If you've been applying the same products, day in, day out, since you were 15 it's time to shake things up! Discover Clinique makeup that’s simple and kind to skin. 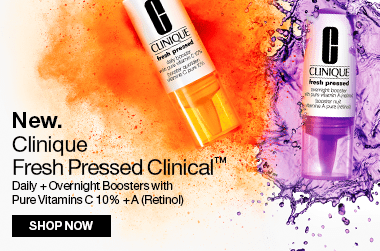 Browse below and find Clinique’s entire range, including Adore Beauty’s favourites the Chubby Stick range and their ophthalmologist tested mascaras. If you’re looking for a new foundation, read our guide on how to choose the right product for your skin! These easy, twist-up Chubby Sticks deliver mistake-proof colour to your face, eyes, cheeks and lips. Top off your look with Clinique’s most popular ophthalmologist-tested mascaras. Showing 20 products of 75. Great for the no make up-make up look! Provides coverage on days you want your lips to look like they are wearing something but not too over the top. Wear wise it is quite lasting and I am able to apply in the morning and only have to reapply infrequently. I heard sooo many amazing things about this foundation so decided to give it a try. The colours were amazing and I found a perfect match, however after wearing it for a few hours it made me look so oily/shiny & it began to separate quite badly. I tried different setting powders to see if that helped, but to no avail. It just doesn't like my skin (oily/combination). Worth a shot if you have dry skin as it's a beautiful foundation.